Why it makes more sense to renew your insurance with Maruti Insurance. You can transfer your insurance at the time of renewal to Maruti Insurance with the benefit of a no-claim bonus transfer. You no longer need to pay upfront and wait for months to get your insurance claim reimbursed. You can drive away in your restored car by just paying the marginal difference of applicable depreciation to your dealer. Need to do it with Authorised Delear only. 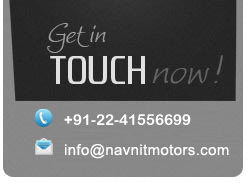 Navnit Motors becomes a single point of contact for all your insurance needs like renewals, Claims and post accident repairs. In case of an accident in a difference city you still have access to Maruti's nationwide network of dealer workshops that will help you through the insurance claim. Maruti Insurance Policy is available on our Internet by which we can issue the policy instantly. There is no need to wait for the policy.